After you have created a points type, you may later want to change its settings. 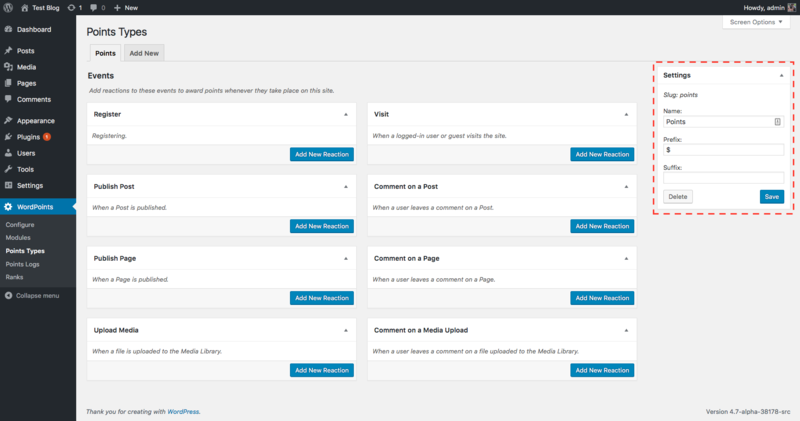 To do this, you just need to navigate to the WordPoints » Points Types administration screen, and then navigate to the tab for the points type you’d like to edit. There you’ll see the settings form for that points type. You just need to enter the new values you want for each setting, and click the “Save” button. When you open the settings form, you’ll also notice the slug for that points type displayed above the “Name” field. 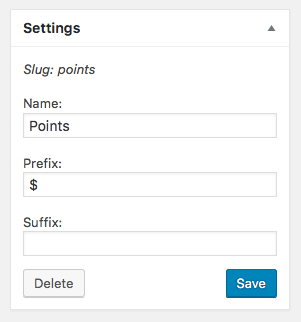 The slug of a points type is the unique and unchanging identifier for that points type. It will stay the same even when you change the name of the points type. You might sometimes need to know the slug of a points type, such as when you need to use it in a shortcode. The slug is used in cases like this, because if you used the name of the points type in the shortcode, your shortcodes would break whenever you changed the name of your points type. It is usually easy to guess the slug of your points type without having to look it up. The slug will be the original name of that points type, with all letters lower-case, and any spaces replaced with dashes (Prior to WordPoints 2.2.0, any spaces were removed, instead of being replaced with dashes.) Remember that the slug will always be based on the original name of the points type though, and might not match the current name if you have changed that setting.